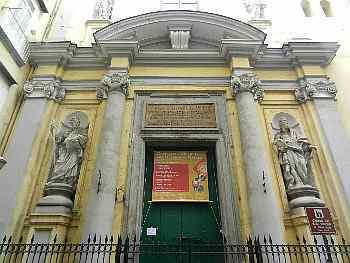 I hesitate to call the church of Santi Filippo and Giacomo (Saints Phillip and James) "non-descript," that is, of no particular class or kind, ordinary. Maybe it's just "ordinary" compared to the other churches in the historic center; you'll walk right by it on via San Biagio dei librai (#24 on this map) as you rush from the grand square and church of San Domenico Maggiore on your way to the even grander Duomo or mysterious subterranean market beneath the nearby church of San Lorenzo Maggiore. As you walk by it, you may not even notice the two magnificent statues of the saints staring down at you from the face of the church. 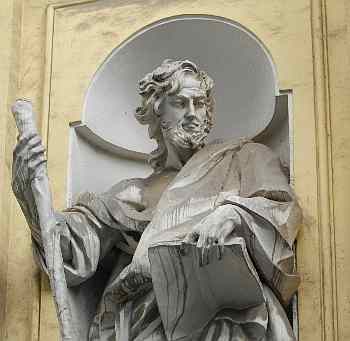 (Below: detail of the statue of Saint James, the one on the left on the facade.) They are the work of Giuseppe Sanmartino, one of the great Italian sculptors of the 1700s, the same artist who did the famous Veiled Christ (which you probably have just seen a few minutes earlier) and numerous other works in the city of Naples, including the figures high atop the large church of the Girolamini on via Tribunale, the next parallel street to the north. The Aragonese dynasty (rulers of Naples from 1442 to 1503) imported the silk industry to Naples, where a very influential Silk Guild (Corporazione dell' Arte della Seta the members of which were either producers or merchants of silk) swiftly took hold. The silk guild was highly valued by the Aragonese and later Spanish rulers of Naples and enjoyed an unusual amount of autonomy, even having its own legal and court system when it came to dealing with guild members. In around 1580 the guild founded and sponsored an original church some distance away near the old Mercato; that church was dedicated to saints Phillip and James and hosted a conservatorio —in the original sense of the word; that is, a shelter, in this case for young girls, often orphaned children of guild members who had died. The original premises proved too small and in 1593 the Guild decided to move to the current site and build a larger church, the one that we see today. What we see today on the outside, however, is the product of a 1758 reconstruction by Gennaro Papa, a respected architect of the period. Some items inside the church are earlier, such as the multicolored tile floor from 1738 by Donato Massa, who was also one of the principal creators of the tiled courtyard of Santa Chiara. The holy water fonts in the church of Phillip and James are by Domenico Antonio Vaccaro, one of the great Neapolitan craftsmen of the early 1700s. The church also contains a remarkable wooden, gilt altar by an unknown craftsman but dated 1757. 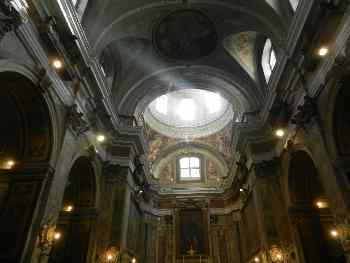 Canvasses and frescoes from the 1700s within the church are by Alessio d'Elia, Jacopo Cestrao, Lorenzo de Caro and Francesco La Marra; as well there are some anonymous items from the earlier history of the church. The church is currently active and open. You are in for a bit of a surprise if you enter from the crowded and narrow street into the splendid interior (photo, above). Rocca, Lilia. (1993) Entry on "Filippo e Giacomo" in Napoli Sacra, Guida alle chiese delle Città, vol. 5. Elio di Rosa editors. Naples.